My sturdy bottom basket is designed to be easy to crochet and has a unique easy to attach handles that solve the saggy bottom problem I see in most crochet baskets. 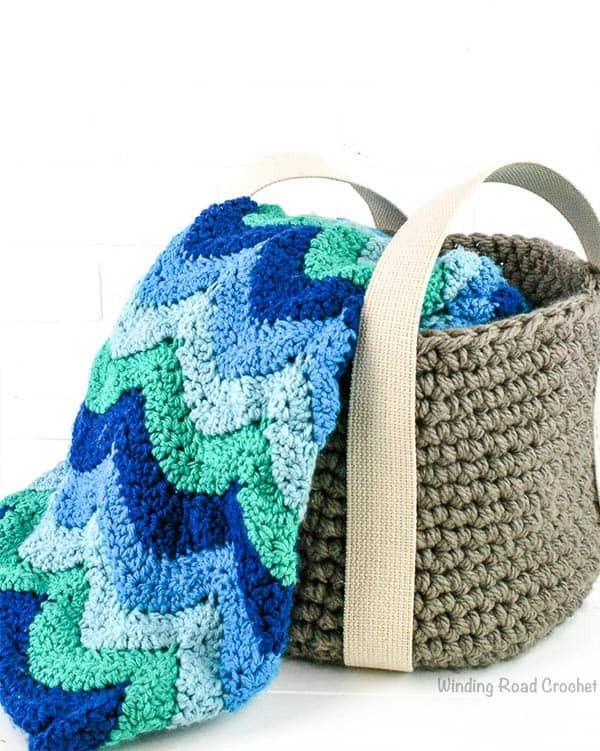 I truly love the idea of a crocheted basket but most baskets I have seen have two flaws. First if you fill them with something heavy, the bottom is going to stretch and sag. The second is that to reduce this you have to crochet with a thick yarn and a small hook. This can leave your wrist very sore. After making a few baskets this way I started looking for a better design. I wanted to be able to make a lot of baskets. Like most crocheters I yarn shop faster than I crochet and making these baskets would both use up some of my yarn stash while providing a storage solution for the rest of it. I wanted to be able to make these baskets quickly, make them sturdy and not have a sore wrist when I was done. The solution, a better strap. I will show you how to quickly add a strap to your basket that will support the bottom and keep it from stretching. With this extra support you can then use a larger hook and a looser stitch to reduce strain on yourself. For my handles I used the trim fabric stores sell by the yard. I picked up a strudy strap like trim piece at my local Joanns to use as basket handles. Joanns had trim in all materials and thickness from leather to woven canvas and colors from tan to bright pink. Check out some of my other free patterns! I made two sturdy bottom baskets using the same pattern. The smaller basket is made with one strand of chunky yarn and a size 8mm crochet hook, the larger basket is made with two strands and a size 12mm hook. We will be working in a continuous round. We will not be turning or slip stitching at the end of each round. Use a stitch marker to mark the first stitch of the row you are working on. Each row I will tell you to repeat the stitch sequence in the parenthesis until you reach the stitch marker. In case you want to count, you will be repeating each sequence 6 times. R1: 6sc in MC. Place your stitch marker into the first stitch. Move the stitch marker to the new first stitch at the beginning of each row. R3: (Sc, inc) repeat from (to) until you reach the stitch marker on the first stitch of this row. R4: (2Sc, inc) repeat from (to) until you reach the stitch marker on the first stitch of this row. R5: (2Sc, inc) repeat from (to) until you reach the stitch marker on the first stitch of this row. R6: (3Sc, inc) repeat from (to) until you reach the stitch marker on the first stitch of this row. R7: (4Sc, inc) repeat from (to) until you reach the stitch marker on the first stitch of this row. R8: (5Sc, inc) repeat from (to) until you reach the stitch marker on the first stitch of this row. R9: (6Sc, inc) repeat from (to) until you reach the stitch marker on the first stitch of this row. R10: (7Sc, inc) repeat from (to) until you reach the stitch marker on the first stitch of this row. R11: Sc in the BLO around. R27: Slst in the next two stitches and FO. Weave in your ends. The straps are the trick to making this a sturdy bottom basket. The straps criss cross at the bottom. When you lift the basket using the straps you are lifting from the bottom of the basket using the straps and not relying on the yarn or your stitch work. First fire up your hot glue gun and get it ready. Next fold your trim piece in half and mark the very center. Line this up with the center of the basket. Using your glue gun apply glue to the strap starting about 2 inches from the center point. We are leaving this part unglued for now because we will be slipping the ends of the straps under this section to hide them. Slowly use a generous amount of glue and glue the strap to the basket about 2 inches at a time. Try to keep the strap as straight as possible while working across the bottom and up the side of the basket. Once you reach the top of the basket with the first strap, go back and work on the second side directly across from the section you just glued. Take your ends are tuck them halfway under the center of the bottom of the basket, where you left the strap unglued. Make sure the straps form a cross and begin gluing each side across the bottom and up the sides. You can also add some glue to the strap ends that you tucked under to secure ends to the basket and the strap hiding the ends to the ends. Now the straps are complete. The straps on my smaller basket were thinner and I decided to add some extra stitch work to dress it up. This is not necessary. As long as you glue generously, you do not need to do anything extra to the straps. I have been able to carry a stack of books in my larger basket without any stretching. Your Sturdy Bottom basket is complete! Wasn’t that easy? Leave me a comment below and let me know what you thought. If you make a Sturdy Bottom Basket, I would LOVE to see a picture! Post it to any social media and tag me @windingroadcrochet or #windingroadcrochet ! I would love to see your work! Want more Quick and Easy Pattens? Check these out! Want to know what I am making next? Follow me on Instagram @windingroadcrochet to see sneak peeks of what I am up to and to be notified of when I release new free patterns. You can also follow me on Pinterest and Facebook. Written pattern, tutorials, graphs and pdfs are copyright Windingroadcrochet.com. Please do not reprint or repost this content as your own, but please feel free to share this link with others. You can find more information on sharing my work with others in the Terms and Conditions Page.